November is here, and that means the holidays and the anniversary of Trump’s popular vote loss are upon us. 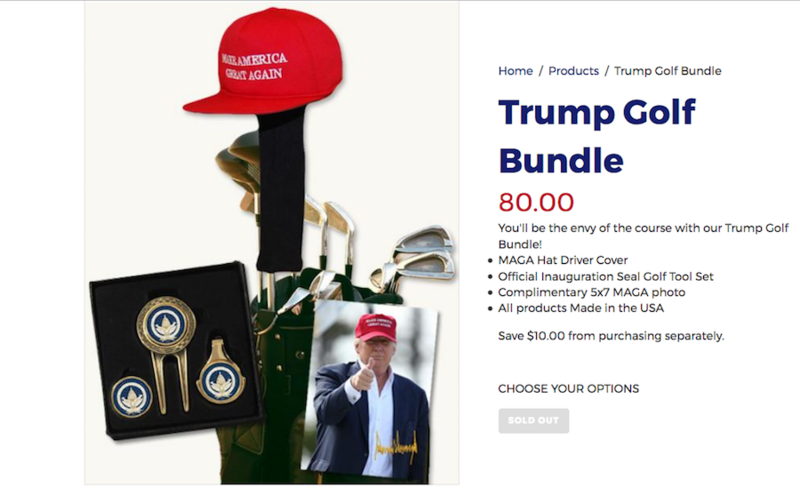 If you’re looking for “that special something” to celebrate, look no further: Donald J. Trump for President, Inc. and the Republican National Committee have unveiled an exquisite offering of POTUS products to mark Trump’s triumph and the 292 days, 5 hours, and 42 minutes he has spent trying to impeach Hillary Clinton. 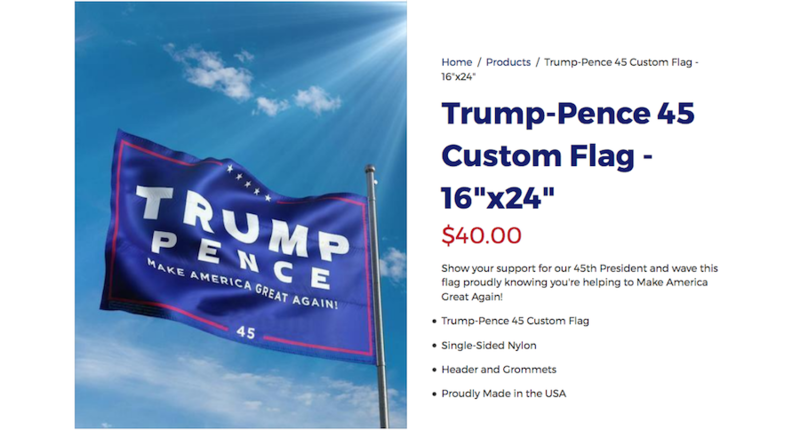 From the iconic MAGA hat to official inauguration pint glasses, there’s something for everyone, without any shortage of opportunities to put your hard-earned minimum wages to work! Consider the $45 Trump Commemorative Medal—a must-have that’s sure to look charming on your pumpkin plaid table runner alongside the turkey and Thanksgiving décor. These treasures are crafted by red-cloaked handmaids with white bonnets, who dutifully carve the medallions from gold leaf pried from the cornices of Trump Tower (Ivanka drops in occasionally to oversee this empowering initiative). Sure, you may have earmarked your money for other causes (such as the advanced life support system you’ll need when your medical insurance gets axed). 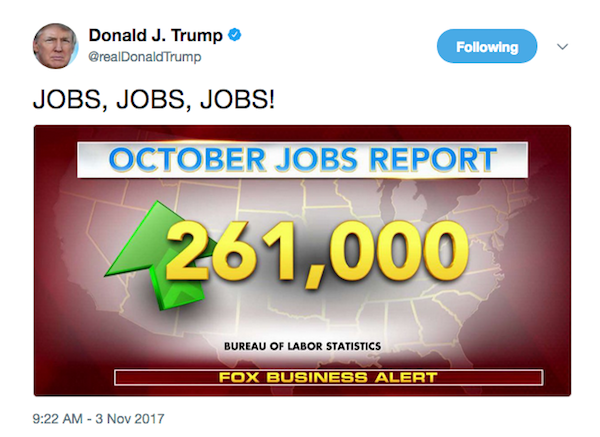 Fear not: Tweets from the president assure that your prospects have never been better! Your president is giving YOU a unique opportunity to continue the progress, fund his campaign, and celebrate the tremendous contributions he has made during his first year in office (or what may feel like the longest decades of your life). Value-add: We now know that the RNC has been spending 10 percent of contributions on legal fees to defend 45 against Russia collusion inquiries et al. 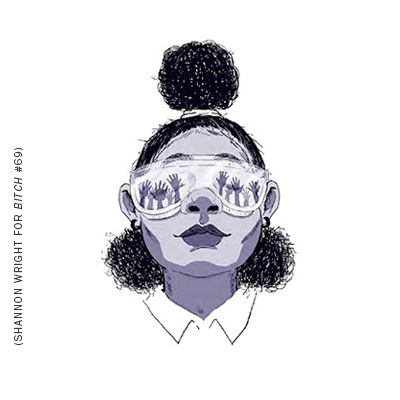 Remember, it’s small donors like you that make this $2+ million expenditure possible. As Trump’s base knows, there is no bar too low for our president. Making fun of the disabled; boasting “I could shoot somebody and I wouldn’t lose voters;” waiting two weeks to speak to families of fallen Green Berets (then telling an army widow her husband knew what he signed up for). How low will he go? The true Trump fan knows that no low is too low. That’s why in the probable event that the president decides to pull his pants down on a stage—be it a rally or United Nations convention—you’ll want to be stocked up on red MAGA caps to toss at his offending member like a kid playing horse shoes at a county fair. Buy as many hats as you can afford! You won’t want to miss out on the fun! As a bonus, supporters of Donald Trump will no longer have to whisper to each other, “Oh God, made in China! Don’t tell anyone!” or “Crap! It’s made in Vietnam!” Thanks to Trump’s initiative to put Americans back to work, assembly lines for these fine mesh hats are located right here on American soil! You will not find the national flag of the United States with the traditional 50 stars and 13 stripes on Trump’s shop site. The country belongs to Donald J. Trump, and he wants you to know it. When this 16”x24” beauty flies in 180 mph Category 5 hurricane winds, it will remind you not only that Miami will eventually be lost to the sea thanks to unmitigated climate chaos, but also that that the White House has been thoroughly hijacked. When you come up for air from the next biblical flood, you’ll have a chance to remember that your country is no longer your own as you admire this flag flying high in the breeze! Nothing says support Team Trump like a set of collectible loudmouthed mouthpieces! These 7-inch megaphones employ proprietary technology that automatically converts any intelligent words you might utter into unintelligible and vulgar phrases. Each bullhorn is equipped with two Invective Channels that allow for a continuous stream of criticism and expletives directed at the target of your choice: Channel A - Barack Obama, Channel B - Crooked Hillary, or Channel C - the failing and dishonest liberal media! These megaphones are ideal for any occasion, whether joining POTUS in a catcall at a Miss America pageant, or for cranking up the volume while shouting, “Don’t forget to wear your flip-flops in the bathroom” at his sentencing hearing for obstruction of justice. It’s hard work to be that “nasty and mean and vicious” (to use his complimentary phrasing.) The dedicated fan can now stay hydrated at the next hate rally with Trump’s stylish 16-ounce drinkware! 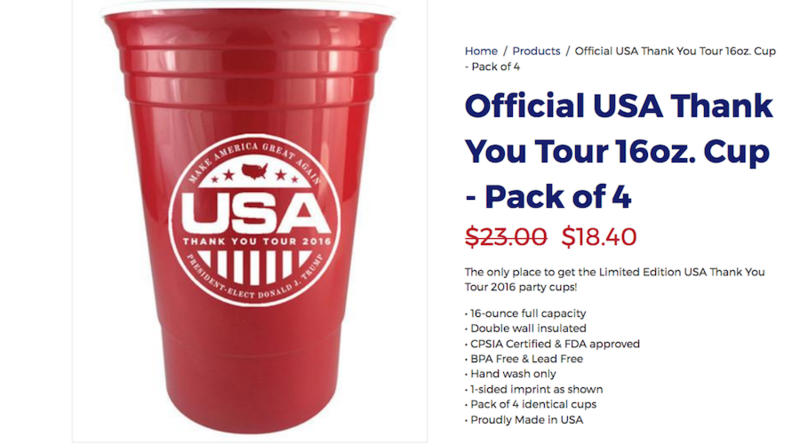 The cups are also FDA-approved for off-label use as Tiki-Torch extinguishers and are “double wall insulated” (guaranteed to keep the Mexicans and brown-skinned people out). A favorite of the reviewers and one of the most popular items on 45’s shop site, Inauguration Gold Seal Coolies fit snugly around your Busch (and Bud Light and Old Milwaukee). Keep your support (and yourself!) high with premium protective foam wrappers while you sip your cares away waiting for FEMA to rescue you from the next “UNnatural” disaster. There’s no better way to show your support for fellow citizens during a humanitarian crisis than to ignore them while taking a few weekends to golf before dropping in to toss some paper towels. With so many disasters befalling the country, no wonder these beauties are SOLD OUT! Movie lovers will never forget Robert Duvall’s Apocalypse Now line, “I love the smell of napalm in the morning.” NOW you can have your very own personal saying when you wake up each day to your very own Apocalypse. Paid for by Trump Make America Great Again Committee, a joint fundraising committee authorized by and composed of and self-congratulated by Donald J. Trump for President, Inc. and the Republican National Committee.